Born in New Orleans, Louisiana, Drexler lived in the South Park area in Houston, Texas, and attended Ross Sterling High School in Houston, where he was a classmate of tennis player Zina Garrison. As a sophomore, he made the varsity baseball team, and tried out for the basketball team but failed to make the cut. Drexler played as a 6 ft 6 in (1.98 m) center as a senior. He began receiving attention from college coaches following a 34-point, 27-rebound performance against Sharpstown High School during a 1979 Christmas tournament. After graduating in 1980, he was recruited by New Mexico State University, Texas Tech University, and the University of Houston, the latter after childhood friend Michael Young told an assistant to head coach Guy V. Lewis that Drexler was the best player he had faced in high school; Houston was able to recruit them both due to Drexler's friendship with Young and his desire to stay home. Drexler majored in finance and worked at a bank during the summer. Lewis recalled in 2003 that he initially received hate mail from Houston supporters and alumni for recruiting Drexler, as they felt that he was not good enough to play for the school. Drexler and Young, along with Larry Micheaux and new recruit Hakeem Olajuwon (known then as Akeem Olajuwon), comprised the "Phi Slama Jama" basketball fraternity that gained national attention for its acrobatic, above-the-rim play. New players were "initiated" into the fraternity by having to stand underneath the basket as Drexler drove in from halfcourt and threw down a tomahawk slam over them. Houston made the first of Drexler's two straight Final Four appearances in 1982, where they lost to eventual champions North Carolina. He averaged 15.2 points and 10.5 rebounds (second in the Southwest Conference) per game as a small forward as Houston finished 25–8. The 1982–83 campaign saw Houston return to the Final Four ranked No. 1. They were matched up against No. 2 Louisville and the "Doctors of Dunk" in the semifinals, which Houston won 94–81 following a brilliant dunking display by both sides, including a double-pump slam by Drexler that Sports Illustrated writer Curry Kirkpatrick called "your basic play of the century". He finished with 21 points, seven rebounds and six assists, but in the championship game against North Carolina State, Drexler failed to make an impact after picking up four fouls before halftime, and scored only four points on one-of-five shooting and two free throws in NC State's upset victory. Drexler declared for the NBA draft as a junior, leaving Houston with career averages of 14.4 points, 3.3 assists and 9.9 rebounds in three seasons. In addition to being named the Southwestern Conference Player of the Year and a first-team All American his final season, he remains the only player in school history with combined totals of at least 1,000 career points, 900 rebounds and 300 assists, in addition to being Houston's all-time steals leader with 268. In the 1983 NBA draft Drexler was selected by the Portland Trail Blazers with the 14th overall pick. He averaged 7.7 points in 17.2 minutes per game in his rookie season. His second season was his breakout season, in which he averaged 17.2 points, 6 rebounds, 5.5 assists and 2.2 steals per game. In his third season, Drexler made his first All-Star team while averaging 18.5 points, 5.6 rebounds, 8 assists and 2.6 steals. In the 1989–1990 season, Drexler led the Portland Trail Blazers to the NBA Finals, averaging 26.4 points and 7.8 rebounds, but his team lost to the Detroit Pistons in five games. In the 1990–1991 season Drexler led Portland to a franchise best 63–19 record. Heavily favored to win the West, the Los Angeles Lakers upset the Trail Blazers by winning the Western Conference Finals. In the 1991–92 season he made the All-NBA First Team and finished second to Michael Jordan in MVP voting. He met Jordan's Chicago Bulls in the NBA Finals that same season only to fall short, as Jordan and the Bulls went on to win their second consecutive championship. In the six-game series against Chicago, Drexler averaged 24.8 points, 7.8 rebounds and 5.3 assists per game. In 1992, he was selected to the U.S. Olympic basketball team, nicknamed "The Dream Team", which won the gold medal in Barcelona. On February 14, 1995, with the Blazers out of serious contention for a championship, Portland honored Drexler's request to be traded to a contender and sent the Blazer great back home to the Houston Rockets, along with Tracy Murray in exchange for Otis Thorpe, the draft rights of Marcelo Nicola, and a 1995 first round draft pick in mid-season, right before the trade deadline. Despite finishing the regular season with a record of 47–35, which placed the Rockets 6th out of 8 playoff teams in the Western Conference, Drexler and long-time friend Hakeem Olajuwon helped propel them to an improbable second consecutive championship in 1995, sweeping the Orlando Magic. In his third and final NBA Finals appearance, Drexler averaged 21.5 points, 9.5 rebounds and 6.8 assists per game. During the 1995 NBA Playoffs, Drexler was ejected during a game between the Rockets and the Phoenix Suns by referee Jake O'Donnell, which allegedly stemmed from a personal feud between the two at the time. This would turn out to be the last NBA game O'Donnell would referee, as he was not assigned any further games in the playoffs that year, and eventually retired a few months later. In 1996, on ESPN's NBA Today, O'Donnell commented, "I wouldn't give Clyde Drexler much leeway because of the way he reacted with me all the time. I thought at times he would give cheap shots to people, and I just would not allow it." On February 13, 2009, Drexler participated in the NBA All-Star Weekend's Celebrity Game. Other celebrities participating included Basketball Hall of Famer Dominique Wilkins, National Football League wide receiver Terrell Owens, actor Chris Tucker and four Harlem Globetrotters. Clyde "The Glide" Drexler, as he was nicknamed at the University of Houston and throughout his professional career, was famed for his speed and athleticism on the court and his easygoing and quiet demeanor off the court. 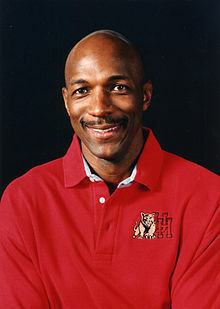 At the University of Houston, Drexler became well known for his exceptional abilities as a finisher, but generally was not considered a great shooter. During his pro career Drexler developed a much more well-rounded game, even becoming an effective post player and more consistent outside shooter. His extraordinary leaping abilities allowed him to be an acrobatic dunker and Drexler participated in numerous NBA All-Star dunk contests during the late eighties. Drexler was regarded as a versatile player, and he was consistently among the leaders at his position in points, rebounds, assists, and steals. He also posted a considerable number of blocked shots for a player his size, ranking third for his career totals among guards. As of 2008, Drexler leads all guards with his career average of offensive rebounds with 2.4 per game. Statistical analysis shows similar players to Clyde include Grant Hill, Anfernee "Penny" Hardaway, and Manu Ginobili. Drexler stayed with the Rockets for three more seasons before retiring from the NBA after the 1997–98 season in order to become head men's basketball coach at his alma mater, the University of Houston. Drexler coached the Cougars in 1998–1999 and 1999–2000. After compiling a 19–39 record in his two seasons, Drexler decided to resign to spend more time with his family. Drexler's No. 22 jersey has been retired by the Cougars (pictured), Rockets, and Trail Blazers. He was inducted as a player into the Naismith Memorial Basketball Hall of Fame on September 10, 2004, in his first year of eligibility. In 2004 Drexler co-authored his biography, Clyde the Glide, with Portland Tribune sports writer Kerry Eggers, and University of Houston classmate and CBS Sports broadcaster Jim Nantz providing the foreword. Drexler set a Trail Blazer record in 1989 by dunking on an 11' 1" rim. Drexler married his wife, Gaynell, on December 30, 1988. They divorced in 2011. He has four children: Erica, Austin, Elise, and Adam (the last three with Gaynell). In 2014 Drexler married his second wife, Tonya, whom he had met through fellow NBA star Dominique Wilkins. Drexler has owned homes in the River Oaks–Memorial neighborhood of Houston and in the Dunthorpe neighborhood of Portland. His brother James and his two sisters, Denise and Virginia, run the family barbecue restaurants in Houston called Drexler's World Famous BBQ & Grill, which includes the "22 Bar". His mother, Eunice Scott, also works at the downtown restaurant that was started by his uncle in 1967. There are two locations, downtown Houston and Bush Intercontinental Airport. Drexler also started investing in real estate in his rookie NBA season, and although he is now mostly retired, he does do some managing of his Drexler Holdings LLC, based in downtown Houston. Drexler is the subject of the book Clyde Drexler: Clyde the Glide. He also wrote the introduction to the children's book Shrews Can't Hoop. Drexler made a guest appearance on Married... with Children, a cameo appearance in an episode of Arliss, and was also a guest star in an episode of The Sentinel. In 2006, he made a cameo appearance in the basketball movie Like Mike 2: Streetball. That same year, Drexler participated in the first season of the Spike TV show Pros vs. Joes, which features three amateur contestants matching themselves against five professional athletes. Drexler was a member of the regular season Green Team and the season finale Orange Team. On February 21, 2007, it was announced that Drexler would participate in the fourth season of the American version of Dancing with the Stars with partner Elena Grinenko. Drexler was the fourth celebrity to be voted off in round five on April 17, 2007. On April 11, 2010, Drexler appeared as a guest on NBC's Celebrity Apprentice in which he helped the men's team "Rock Solid" complete a task to create video advertisements for Right Guard. ^ a b Higdon, David. "Clyde Drexler: Portland's Pride". Sports Illustrated for Kids February 1993. ^ "1991–92 NBA MVP Voting". basketballreference.com. ^ "1992 NBA Finals Composite Box Score". basketballreference.com. ^ "1995 NBA Finals Composite Box Score". basketballreference.com. ^ Monroe, Mike (April 17, 2007). "Downside also apparent in referee's suspension". San Antonio Express-News. Archived from the original on September 26, 2007. Retrieved July 15, 2007. ^ Eggers, Kerry (January 29, 1996). "Here's who should be on All-Star teams". CBS SportsLine.com. Archived from the original on May 7, 2001. Retrieved July 15, 2007. ^ "Players Like Clyde Drexler". NBACompare. Archived from the original on November 6, 2014. ^ "COLLEGE BASKETBALL; Drexler Bows Out After Two Seasons". NYTimes.com. March 31, 2000. Retrieved March 5, 2009. ^ "Clyde Drexler -- GETS MARRIED IN TEXAS". ^ a b c Vondersmith, Jason. "Life’s a glide"[permanent dead link] – Portland Tribune – December 12, 2003. Retrieved April 28, 2013. ^ "Clyde Drexler: Clyde the Glide". Amazon.com. Retrieved January 31, 2010. ^ "Shrews Can't Hoop". Amazon.com. Retrieved January 31, 2010. Wikimedia Commons has media related to Clyde Drexler. Maxey, Wendell. "Clyde Drexler". The Oregon Encyclopedia.